The Jewish people and their state are the target of an unending, worldwide hate offensive. Our reactions differ. Some of us get angry (that’s healthy). Others ignore it. And some become convinced that where there’s smoke, there must be fire. Maybe they hate us because we’re hate-worthy? Nope. They hate us for a lot of reasons, including religion (that’s a big one for Muslims), envy, guilt, and greed – and sometimes it’s just a family tradition. But in fact we are pretty decent, as homo sapiens goes, and so is our country. The facts don’t support the hate industry, so the folks who want us dead have also developed a lie industry to provide fuel for the haters. Today I want to look at one lie of the many excreted by that industry, a lie that is told over and over and has certainly been the cause of the deaths of numerous Jews and Arabs. 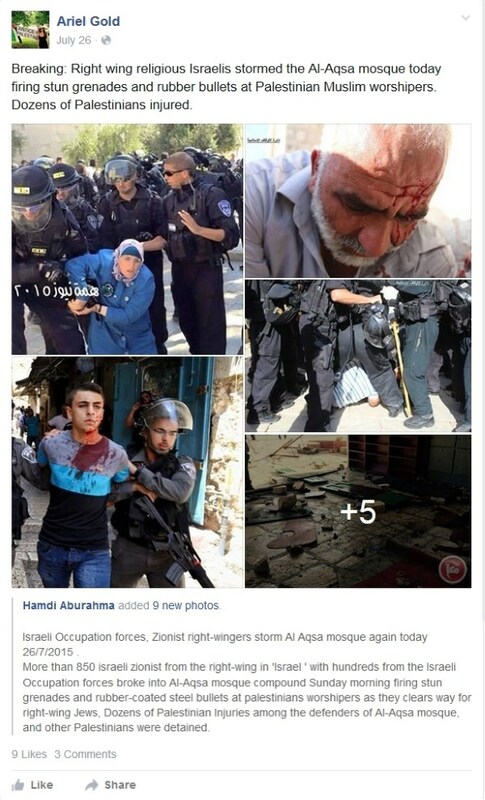 The woman who posted this, Ariel Gold of Ithaca, NY (h/t: Petra Marquardt Bigman), is a piece of work herself, a Jew who describes her occupation on her Facebook page as “delegitimizing Zionism at [sic] Community Activist.” If she does anything else for a living, it’s not evident from her posts, which display her as a one-person demonization machine. During the altercation, police eventually stormed the mosque itself. An unknown number of officers were wounded, and three East Jerusalem residents were arrested for allegedly throwing rocks at Border Police. According to the police, the clashes broke out after the Palestinians began throwing stones and shooting fireworks at Border Police and police forces that arrived at the mosque’s entrance. Afterwards, the youths fled into the mosque, throwing stones and bricks at the forces from within, and firing fireworks at them. An unidentified liquid was also thrown at the police. So it was police, not “right-wing settlers” who “stormed” the mosque, and it was because the thugs (not “worshipers”) inside were planning to violently attack Jews who wanted to visit the site – not to enter the mosque and not to pray, because the status quo that Israel has accepted forbids it. The “status quo” derives from the ill-considered decision made in 1967 by Moshe Dayan to give civil and religious control of the Muslim institutions on the Mount to the Jordanian waqf. Over the years, the Muslims have arrogated more and more power to themselves, at first forbidding Jews to pray, bring a prayer book, or even move their lips suggestively anywhere on the Mount. Recently they have begun to harass and try to intimidate Jews who try to visit by screaming at them from close quarters. Most of the time, the Israeli government has acquiesced in order to try to defuse Muslim agitation, but of course that is exactly the point of the agitation. But who cares about the truth? Not Ariel Gold – and not her Facebook friends. This entry was posted in Information war, Israel and Palestinian Arabs, Jew Hatred. Bookmark the permalink.